Get TWO Jay Leno's Garage Microfiber Super Drying Towel for the price of one! Just add one to your cart and we will put in the second one for free! Say goodbye to those pesky waterspots! Jay Leno’s Garage Microfiber Super Drying Towel, measuring in at 25 x 36 inches, is an extra-large, extra-absorbent detailing towel that quickly dries your wet surface to prevent waterspotting and staining. With a large 500 GSM, the long fibers found on the Jay Leno’s Garage Microfiber Super Drying Towel gently dries without harming your paint! If you’ve just washed your car using Jay Leno’s Garage Vehicle Wash, be sure to dry it up with Jay Leno’s Garage Microfiber Super Drying Towel! 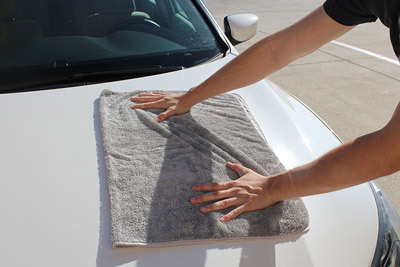 Jay Leno's Garage Microfiber Super Drying Towel measures 25 x 36 inches and will easily dry your entire car! I can’t tell how many times I’ve seen a freshly washed car left to “dry” in the sun. The heat will dry it right up, right? Well the sun certainly will dry that water, but it’s also leaving a little something behind – waterspots! Most untreated water out there contains trace amounts of minerals that are left behind on your paint when the liquid evaporates. The key to avoiding those unattractive waterspots is by never allowing them to form in the first place! Jay Leno’s Garage Microfiber Super Drying Towel will absorb the water left behind after a wash, never allowing said water to form into waterspots. The long microfibers are super soft and will not scratch the surface. Jay Leno’s Garage Microfiber Super Drying Towel is the perfect size – you can dry a whole sedan with just one towel!